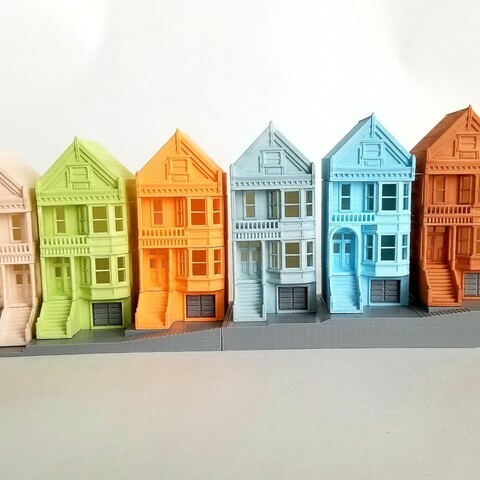 These are custom designed and 3D Printed replicas of the infamous Painted Ladies of Steiner Street in San Francisco California. 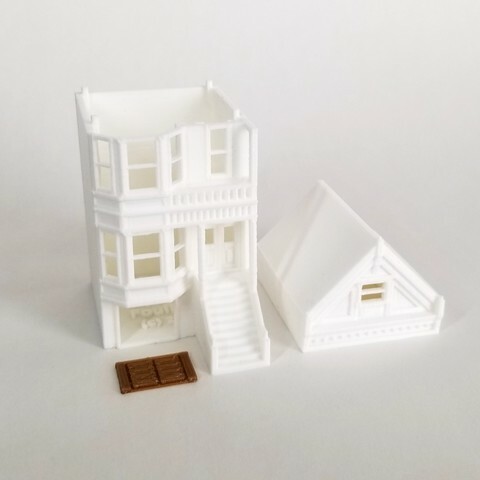 They come fabricated in PLA Plastic with a white shell, copper door, gray base and are ready for your personalized touch of additional paint and weathering. No glue is required as all parts simply and easily snap into place. 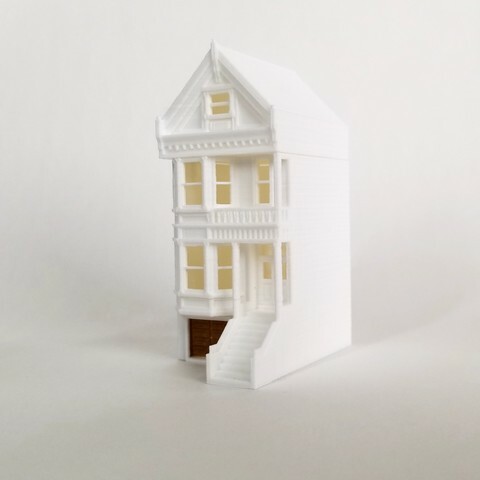 STL files are provided to replicate six houses and a graded mounting base that preserves the slope of the San Francisco Street. 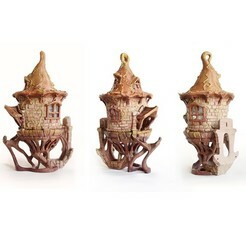 A careful examination of the 6 painted ladies will reveal that there are 3 different elevations used. The first house has the staircase on the right side with an arched entrance. The other 5 houses have the stairs on the left side but 3 of the houses have arched entrances while the other two have square entrances. 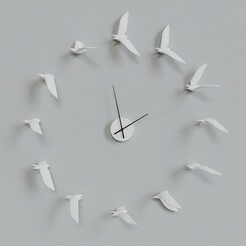 STL files are provided to successfully replicate all combinations. Further, STL files are provided with and without designed-in supports or you may simply use support settings in your slicer. 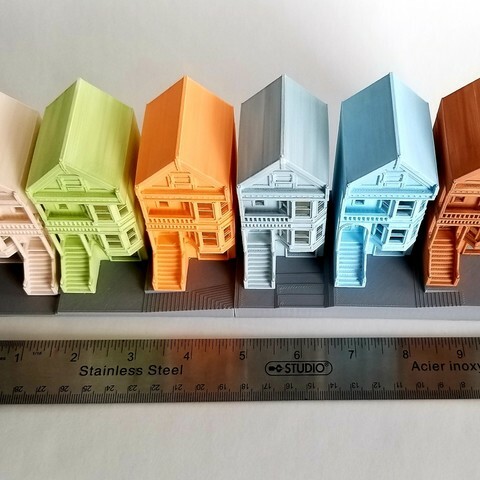 More than a year was spent perfecting product design methods and fabrication processes to produce these beautifully crafted N Scale models of real world buildings and structures. The process begins by carefully examining Google Earth and Google Street View images in order to obtain accurate dimension measurements and scaling for the targeted model. 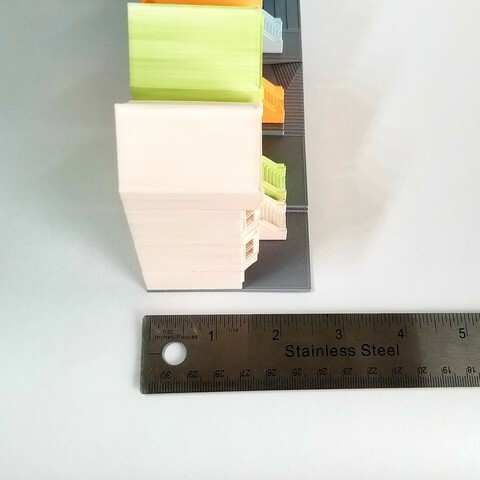 Next, utilizing CAD software, a digital replica of the model is created employing meticulous design guidelines painstakingly developed through countless prototyping iterations. The resulting premium digital file is now ready for fabrication. In the final step the physical PLA plastic model slowly comes to life one layer at a time on the heated bed of an FDM 3D Printer which has been finely tuned and optimized to reproduce the highest possible quality. 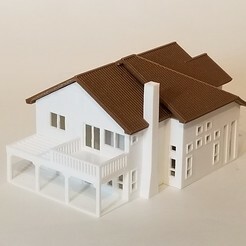 Custom 3D model design and fabrication of almost any building or structure less than 100 ft in length and width. 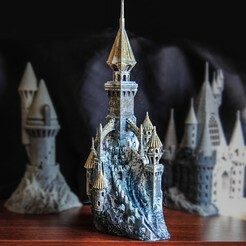 Must be clearly visible on Google Street View or be provided with photographs and dimensions. Please inquire. 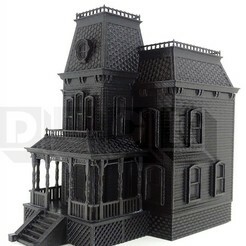 Warning: When printed these models contain small plastic pieces that may present a choking hazard to small children. Recommended age is 10+ years.